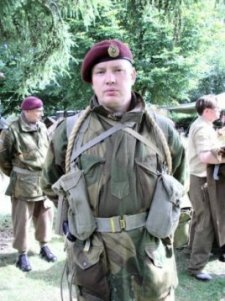 Welcome To My British Paratrooper Page One. 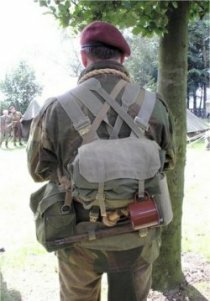 This kitbash I have been planning for quite some time, loosely based on the gentleman below that I saw at Detling. And it was only recently, that I have decided to have a go at trying to recreate it in 1/6th scale with the DiD Michael Taylor figure. But as usual with all of my kitbashes I never seem to make it easy for myself, as I have had some excellent help from Rob on the OSS forum. 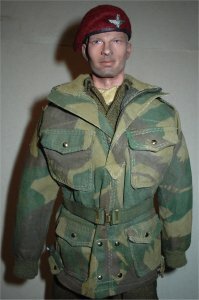 And I am going to repaint the denision smock that came with the figure, because not only does it look too new as it is, I want to get the same effect as I did with my British sniper suit repaint. Also with using the bbi Roger Cooke radio as well, I can then make him as an airborne radio operator. 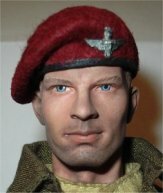 This is the headsculpt as it comes in the box, and after I have given it a treatment of a pastel wash and a drybrush of the lighter flesh colours. The pictures from left to right above show the basic headsculpt, the pastel wash and the drybrush of the lighter colours. The final two pictures above show the excellent Banjoman beret that I have used in place of the DiD one, and it is a vast improvement as it is made from one piece of material instead of the two with the DiD beret. 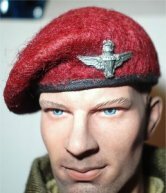 In the final picture above right, I have carefully taken the parachute badge off the DiD beret, repainted it with some Gunmetal paint and rubbed it over the top with a pencil to bring out the detail. This was then placed onto some double sided tape, I then cut around it with my model knife, peeled it off the backing and stuck it onto the new beret. 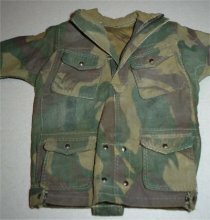 These pictures are of the jacket as it came from the box, and how I have used some acrylic paint to change the colours, so that are both lighter and also so it looks like it has been worn for a while. With the pictures above, they show from the top left to the bottom right how I have repainted the denision smock so it is completely different as it came from the box. In the final pictures above right, and I have given the finished jacket a good scrunch up in my hands to loosen all of the paint and the material. Plus I have given it a light dusting of the grout dust to make it look old and used. 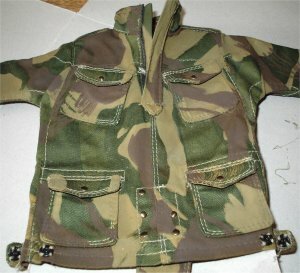 Note: Be careful about the brass buttons as they might come off when you roll up the jacket. Mine did, but I just put the button onto some double sided tape, cut around it with a knife and then stuck it back in position. 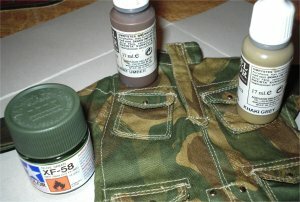 With the denision tunic above, I cannot remember what all of the paints were that I used to re-colour the smock, although I do know that one of the colours was Tamiya XF-58 Olive Green acrylic paint. 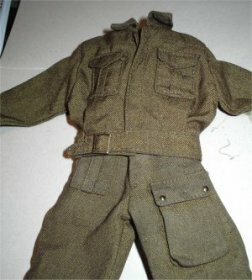 The other colours I believe were the same as the colours I used for my British Wes Worthy sniper figure uniform re-paint. I also used some Acrylic Flow Improver to thin the paint rather than just water, as I found that it helped a lot to keep the paint at a constant thickness so that all of the paint colours went on the smock evenly. With the stiffness of the material afterwards, I found that the smock was not as hard as I thought it would be, I suspect that Flow Improver helped with this. I also scrunched the smock up in my hands after I had left it aside for 24 hours, which also helped to remove some more of the stiffness of the material. 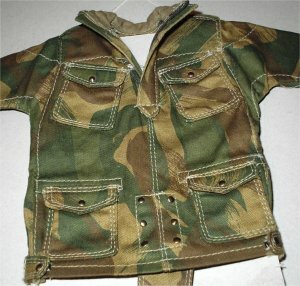 Note: Be careful of the brass buttons on the smock as they could come off. 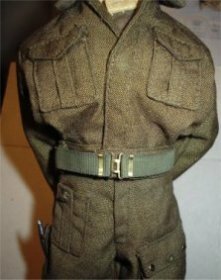 To be honest the amount of British battledress uniforms that are available in 1/6th scale does confuse me, but one thing I have noticed with this DiD uniform. 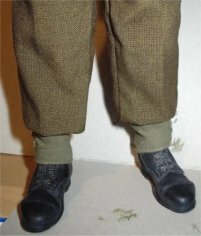 Is the bottom of the trouser legs, as they are a lot better than the current offerings from Dragon, as these one's taper in nicely from the waistband to the leg bottom. When I was aging the webbing below, I wondered how it would work on the uniform I want to use on this figure? So as an experiment I rubbed the trousers between my fingers with some of the grout powder on them. Note: I used only a very light coating of the grout on my fingertips, and as a result I have changed the colour of the trousers slightly, compared to the un-touched jacket in the same picture. And by accident I have rubbed slightly harder on the bottom of the leg pocket, and it has left a very nice darker patch to simulate dirt. Note: I think this came about by having dirty hands after doing the webbing. 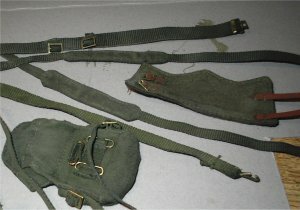 The centre picture above shows the uniform with the waist belt that I gave a paint wash to when I was doing the webbing. 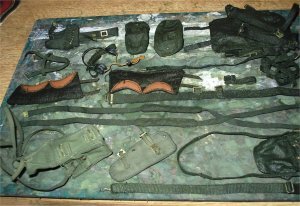 The last picture above shows the Dragon commando knife I used from my spares box, that I have placed in a pocket on the leg. There already is a slight pocket on the trousers, but I cut though the seam slightly with my modelling knife and slipped the scabbard into it. 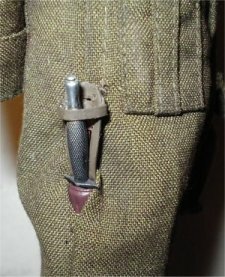 But I found that the knife did not sit right, so I made two small holes in the back of the scabbard, and I sewed the scabbard top to the trouser leg so it laid closer to the leg. I replaced the elastic on the top of the scabbard with a strip of plastic, which was glued in place and then repainted brown. 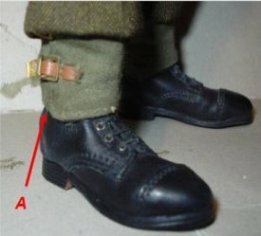 With the webbing for this figure, I have been reading a lot of the posts on the forums by Tony Barton about the colours of the webbing as used by the British troops during WW2. And with that information, the pictures above and the one's from Rob, I have decided to replicate the Green blanco that was used to re-colour the webbing kit. 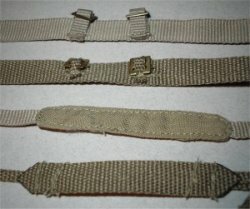 Also to improve the whole look of the webbing kit, I have also used some of the brass strap ends as made by Richard Elborne. In the pictures below I have done a comparison between the Dragon and the DiD British webbing. As a result for my figure I am replacing the webbing straps that came with the figure for the Dragon webbing, as I feel it is a better scale material plus the shoulder pads have a much better detail. These pictures again show the comparison between the Dragon and DiD webbing, the darker courser material is from the DiD figure. 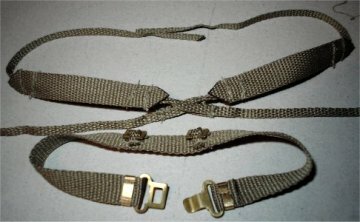 The belt buckles and strap ends are in the picture on the left, whilst the centre picture shows the differences in the rear belt connectors and the shoulder pads. In the picture above right, I have soaked most of the webbing kit I am using for this kitbash in a dish containing some water and Tamiya acrylic paint XF-13. As this is an equivalent paint colour for the webbing as described in the excellent tutorial by Tony Barton for the Blanco colour KG3. The only problem I found with doing this is the material used to make the webbing, in that it produced varying shades of the same colour when it dried off. Which was most annoying as I wanted a worn blancoed look to the webbing, but some of the pieces came out very light. So I added some black acrylic paint to the pot of XF-13 and mixed it together to darken it slightly. All of the pieces went back into a new dish of diluted paint and then left to dry, this did improve it a bit but still I had some pieces looking different to the others. This is when I did an experiment with the grout powder I have used before, in that I placed some on my bench and rubbed my finger tips into it, I then rubbed the fingers together and then gently rubbed this into the webbing pieces. 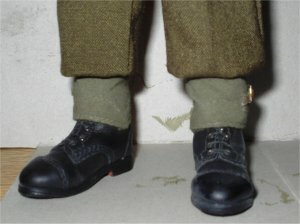 The differences can be seen in the centre picture above with the gaiters. As the lower one has just the paint wash on it, whereas the one in my fingers has been rubbed with the grout powder. The other picture above right has some other pieces with the grout treatment done on them, the bag has had more attention placed on the edges and the tops of the folds. 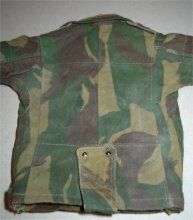 Which has added a nice highlight and age to them, compared to the almost original paint wash inside the folds. 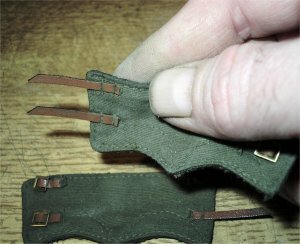 Note: Be careful doing this when you are rubbing the item between your fingers, as you could break the small brass buckles. Also I have found that by varying the amount of grout I use, I can get the webbing to almost the same colour for each part. The boots I am going to use for this figure are the one's that came with the boxed figure, because I can't really justify outlaying for a pair of Newline boots for this kitbash. Besides I want to see if I can improve on the British DiD boots as they are. These pictures are of the repainted boots which was given a coat of some Matt Black acrylic paint, plus when dry a coat of some Matt Medium to reduce the shine. 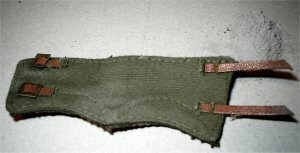 The gaiters were also given a paint wash as below, then fastened loosely around the ankles, pinched together and sewn tight at the point marked A above. The gaiter straps were fastened together so they are tight, the excess strap was then cut off and I fitted a brass strap end to the bottom one's. This one part of the kitbash that I was not looking forward to doing, because getting the inner uniform sleeves down into the Denision sleeves can be a real pain to do. 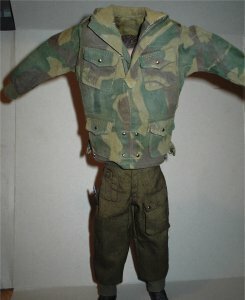 So firstly I removed the beret and the hands, I then put the arms up either side of the head, then slipped the Denision over the figure's head as shown above left. 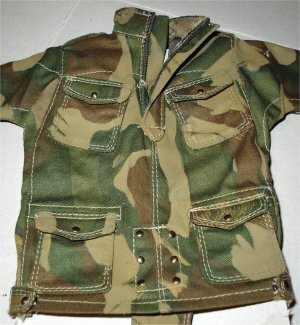 Then I worked the arms into the sleeves and then gradually worked the Denision down into place, I then moved the inner uniform sleeves down inside the jacket and then straightened everything up. Note: Making sure that I kept the jacket off the face as much as possible because of the pastels on it. Once I was happy that I had it all in the right position I adjusted the collar to make it lay down, I then put the belt on around the figure's waist. And I am very happy that the paint wash has come out so well on it. Rob for all of his help with the colours for the Denision smock. Andy (fallingplate) for the help with the radio and Kim (kimbo21) for the rifle.